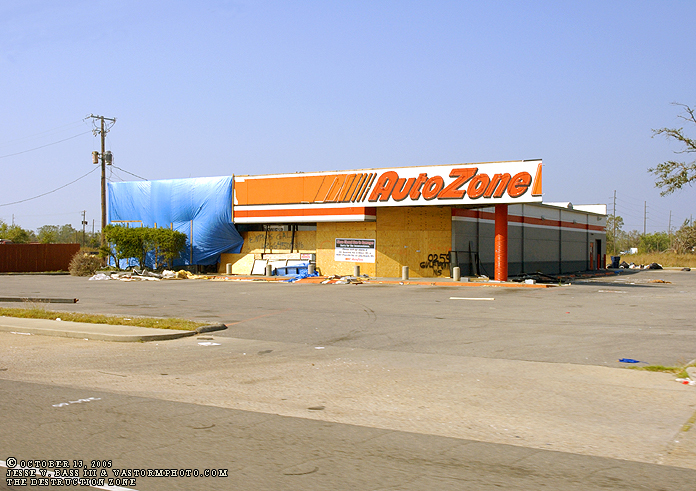 Well as we know, on August 29, 2005 the costliest hurricane to hit the United States came ashore in Louisiana as a category 4 with winds near 135-140mph. Katrina devastated the coastline of eastern Louisiana and all of the Mississippi Gulf coast as the once powerful cat 5 slammed ashore early on Monday morning. H.I.R.T. was on location for the landfall of this monster storm. 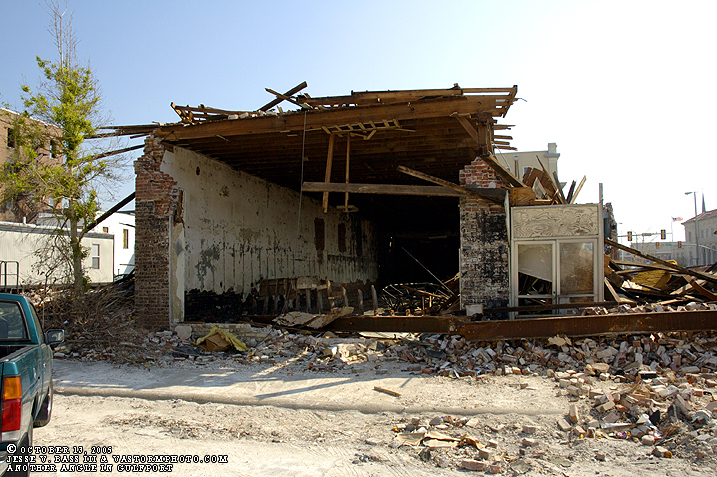 Mark Sudduth and Mike Watkins were in the city of Gulfport during Katrina's landfall. However, they were going to document the landfall from a little town called Waveland west of Gulfport and Biloxi. 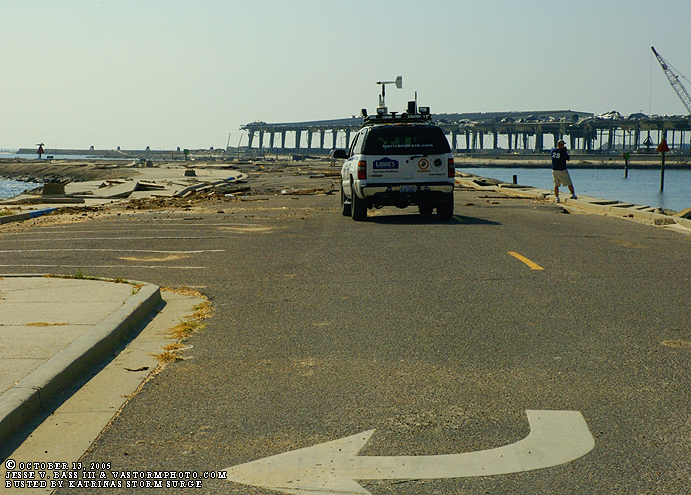 On the night of August 28, they were setting up the remote cameras to capture what was sure to be a massive and destructive storm surge in Gulfport on a paved causeway call Eurie Pier. Mark and I had been on this very pier for the landfall of Tropical Storm Isidore in 2002 as he came ashore in Louisiana. Mark knew by that tropical storm that Eurie Pier would be a great place to leave on of the cameras. As the wind and rain increased in intensity through the night, they had some problems getting the camera and laptop to run and function properly. 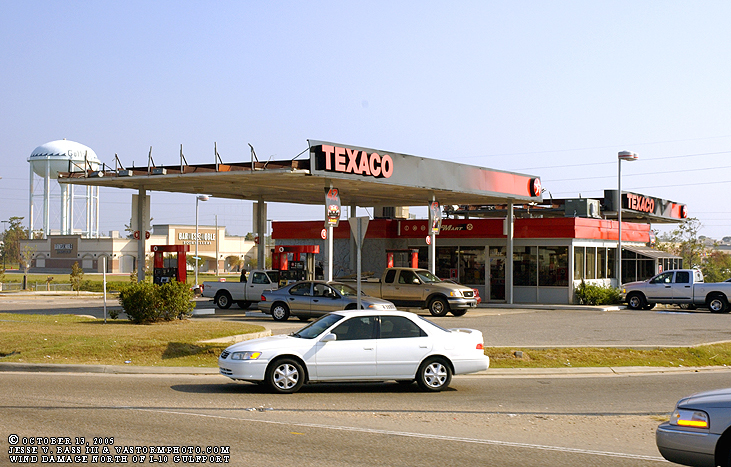 This ate into the time quickly which would not allow them to return to Waveland that night and they would have to stay in Gulfport for the duration of Katrina. Little did they know that this might have been the best place for them. As you will see in the photos below, Waveland was completely destroyed by what is being called a 30 foot storm surge on the area. But first, a little bit about the Gulfport area and what Mark and Mike went through. Mark and Mike stayed at a hotel about 5 miles inland from the Gulf of Mexico- this was a good thing as they may have lost the Chevy Tahoe in the massive surge on August 29th. They set up the rest of the "Storm Cases" around Gulfport, one near Hwy 90 downtown and another near the First Baptist Church of Gulfport. As the sun rose, the winds and rain would continue to increase and Gulfport would go through the eastern edge of the eastern eyewall of Katrina as she moved into the state of Mississippi. Mark recorded a wind gust over 130mph and a roof of a nearby hotel would be ripped off and people saw it happen live on video coming back to Hurricanelivenet.com. 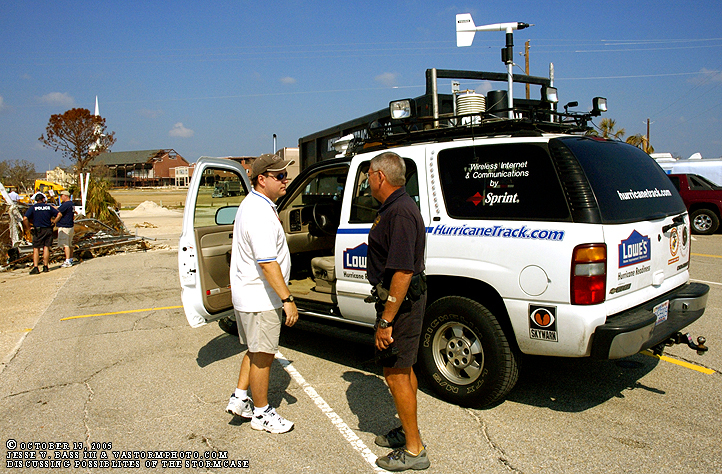 As the winds lessened and the rains let up as Katrina pulled inland to the northwest of the area, Mark and Mike would head out to find the cases that had certainly captured a massive surge. It appeared that Gulfport saw a surge of about 15-18 feet along the coast- the cases were washed away. On their mission to find those storm cases however, they were in utter awe of the destruction and the apparent surge that had leveled the city. 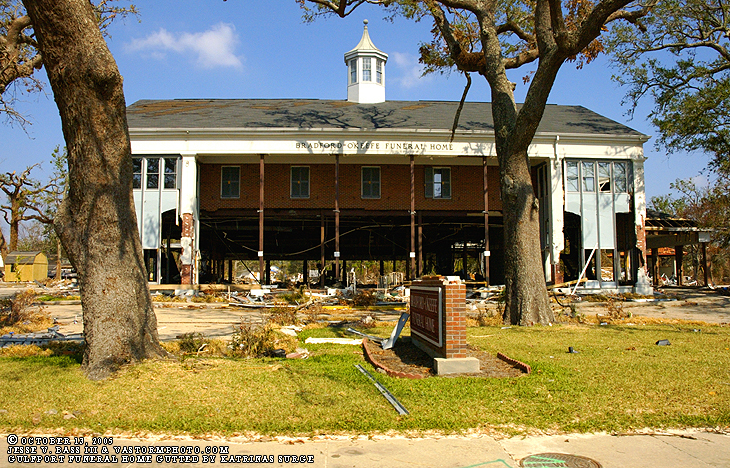 From all accounts, Gulfport suffered more damage and destruction than they did in 1969 when category 5 Hurricane Camille came ashore very close to the area Katrina stormed ashore. 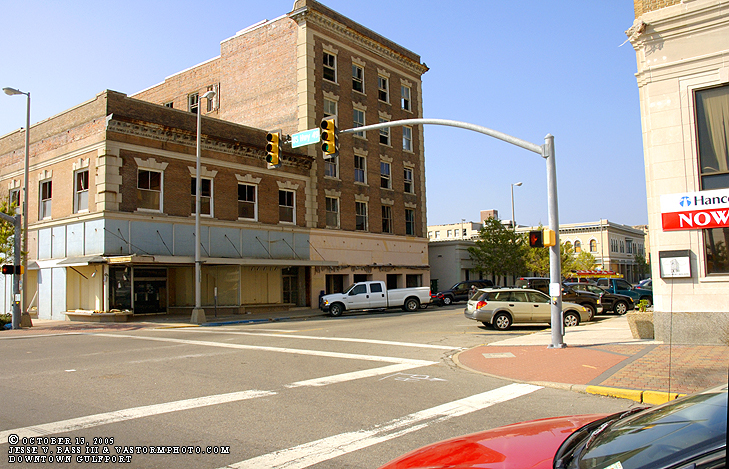 On our trip back in October, we would make our first stop in the city of Gulfport as we would soon make our way westward to Waveland and Bay St. Louis. 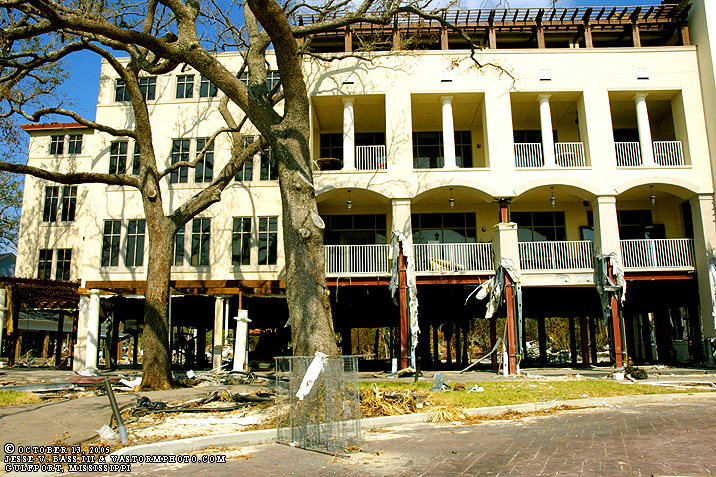 Once into Gulfport it was obvious that progress was being made in the cleanup and rebuilding efforts. 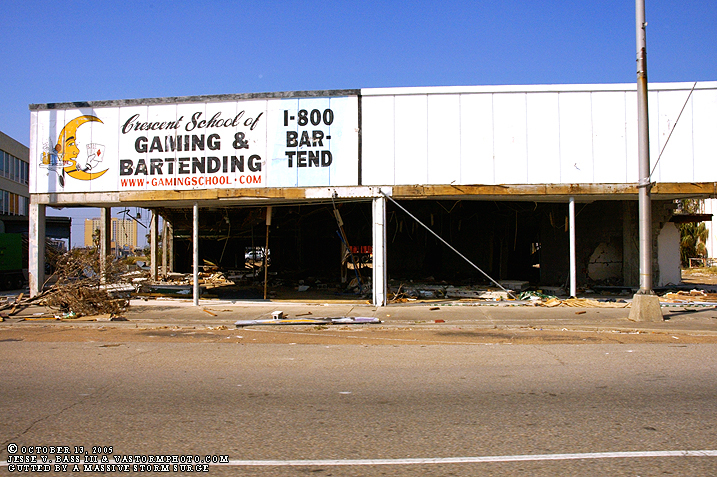 They still have a very long road ahead of them, but it was clear that they would recover and the once popular gambling casinos and local resorts would draw in the vacationers and tourists as they have in the past. 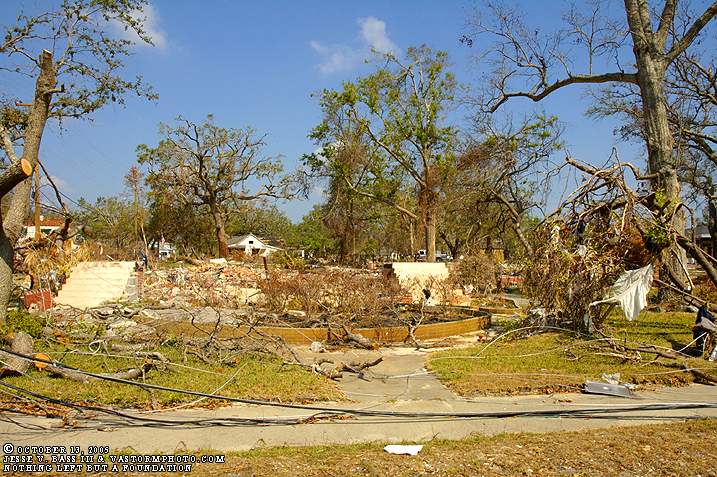 Below are some photos of the city of Gulfport as we entered the city on October 13, 2005. 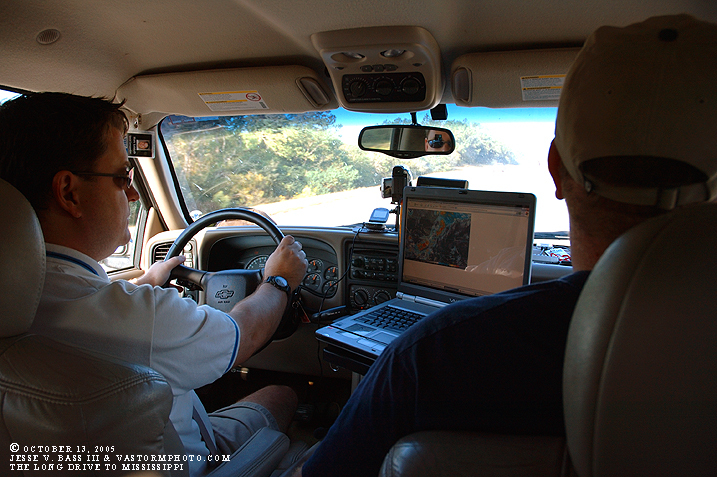 A shot from the backseat of the Tahoe as we drove west along I-10 approaching Gulfport. 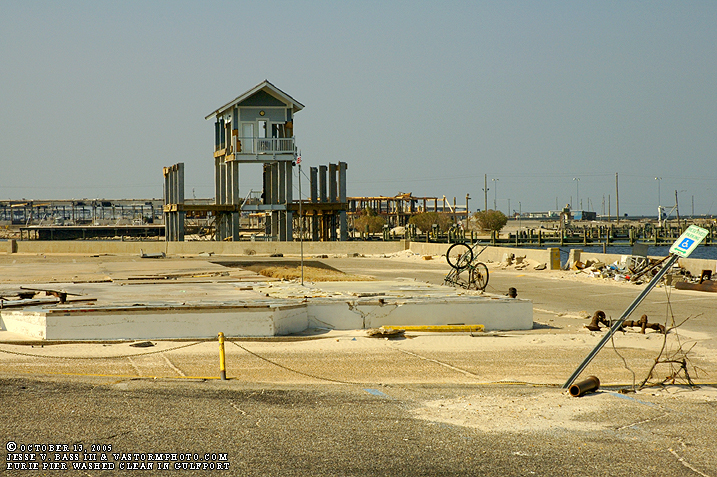 Even as we were heading back to document the Katrina destruction, we were watching the development of what would become Wilma. 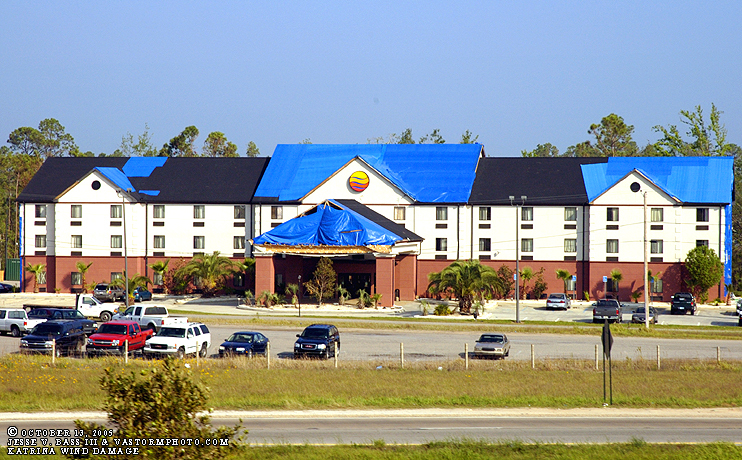 North of and along I-10, roof damage could be seen everywhere with these blue tarps. 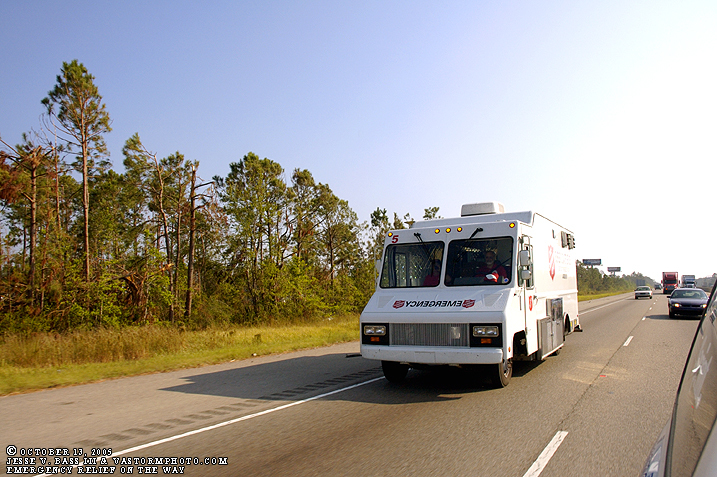 Along the way we saw several emergency response vehicles on their way into the area. This one was from the Salvation Army. 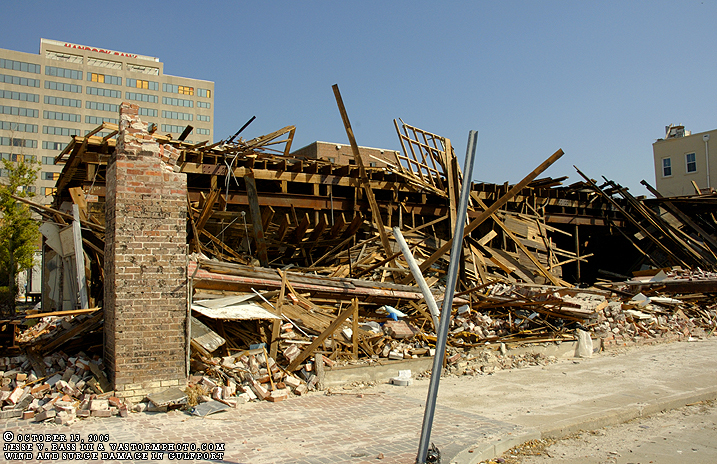 Everywhere you looked you could see evidence of Katrina's wrath on the area. 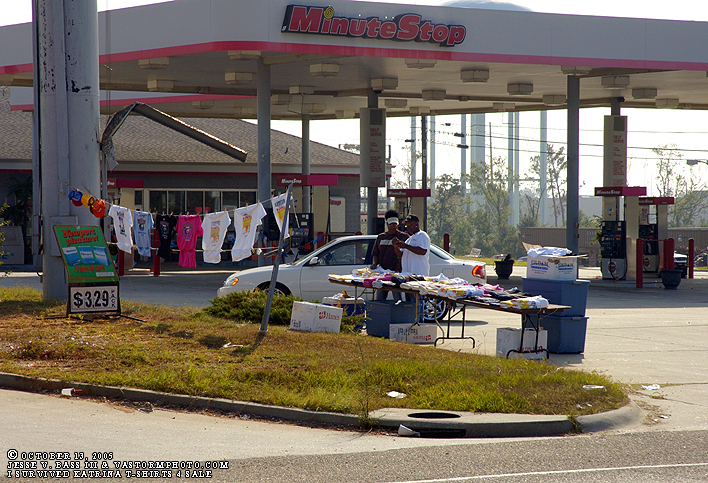 Locals along the roadside selling "I Survived Hurricane Katrina" t-shirts. Now south of I-10 and closer to downtown Gulfport, we started seeing damage not only from the wind but the storm surge as well. 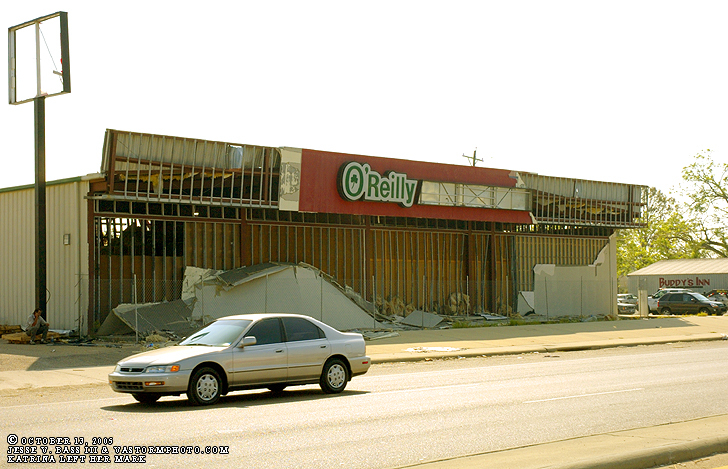 Just a little over a month after Katrina and a scare from Hurricane Rita, places were still boarded up. 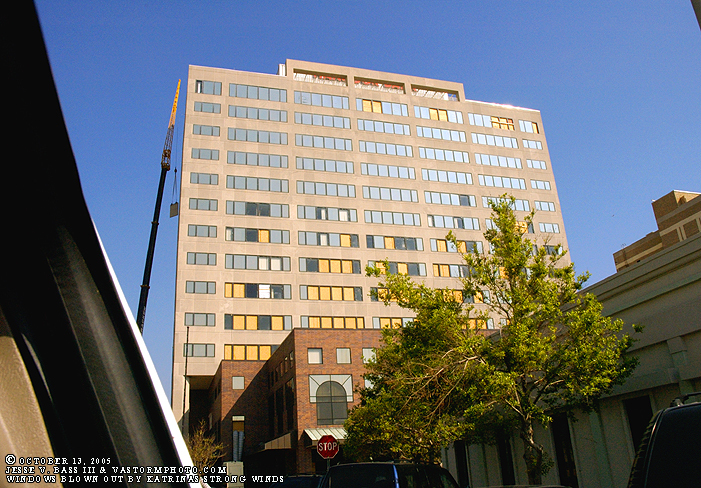 Approaching downtown, buildings with windows blown out sit empty as the massive cleanup continued. 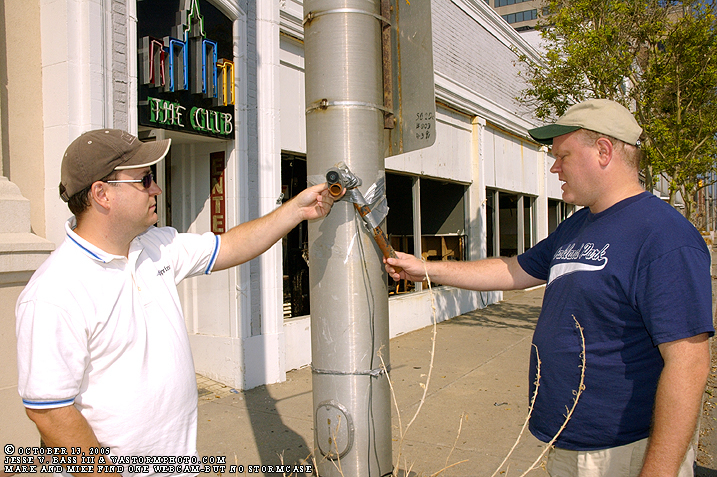 Here Mark and Mike find a camera that was strapped to this pole during the storm, but no Storm Cases to be found. Here in downtown Gulfport, you can see the damage caused by the storm surge. 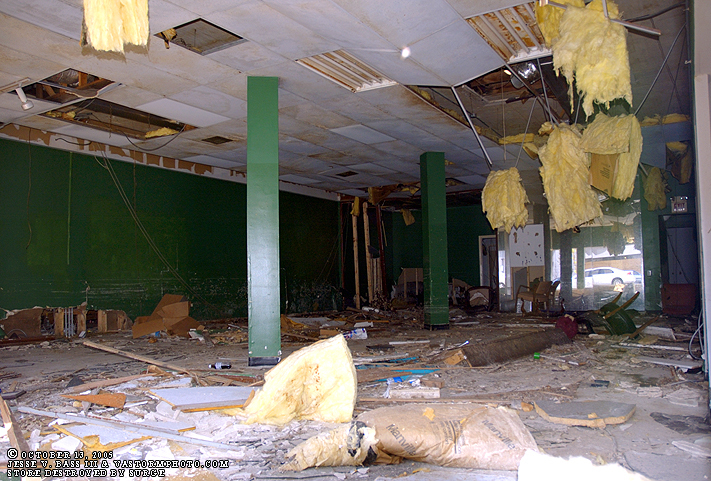 Buildings and businesses were gutted by a nearly 20 foot surge. We looked inside for the Storm Cases with no luck. Heavy damage from storm surge flooding. Many buildings in Gulfport were just like this one above. 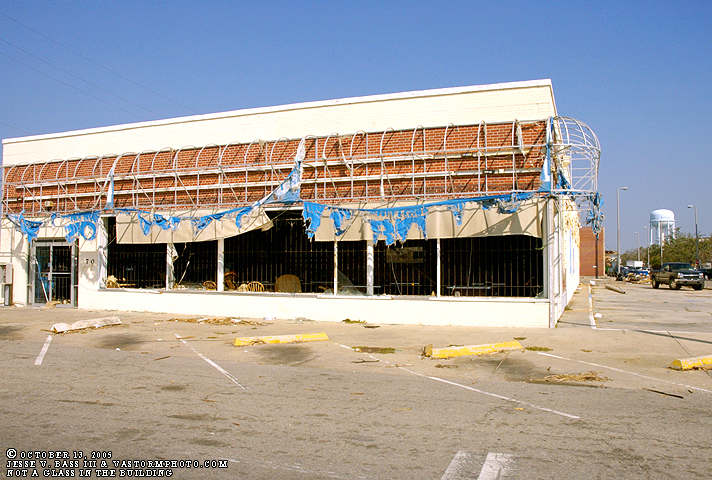 Windows blown out by the cat 3-4 winds on August 29, 2005. 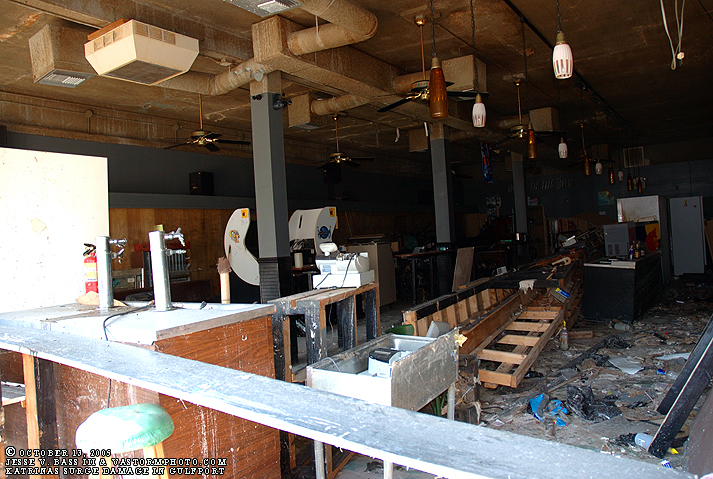 It seemed that if you were within a mile or so from the Gulf of Mexico, you saw massive surge damage to businesses and homes. Out on Eurie Pier the restaurant that once stood is no longer. Nothing left but the foundation and the safe they used to keep the money in. H.I.R.T. member Mike Watkins walks around Eurie Pier looking for the other camera and Storm Case. In the distance you can see the damage to the trees along the coastline. All the leaves had been stripped or killed by the salt water and air as the surge washed ashore. Old Glory still flies high over the Pier. Near the southern most point of the pier, benches and the small lighthouse have been washed away. Also, notice the damage to the roadway on the left due to the power of the breaking waves. 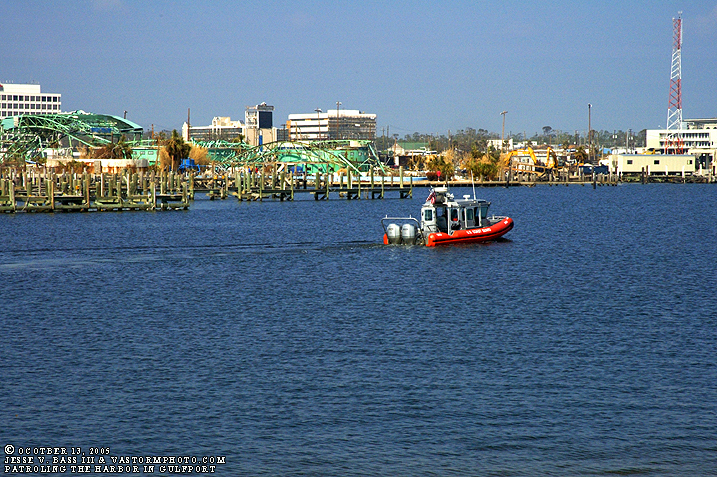 The job continues for the local harbor patrol of protecting the waters and I am sure helping in the cleanup efforts. Mark talking to an officer who's office was out on Eurie Pier. 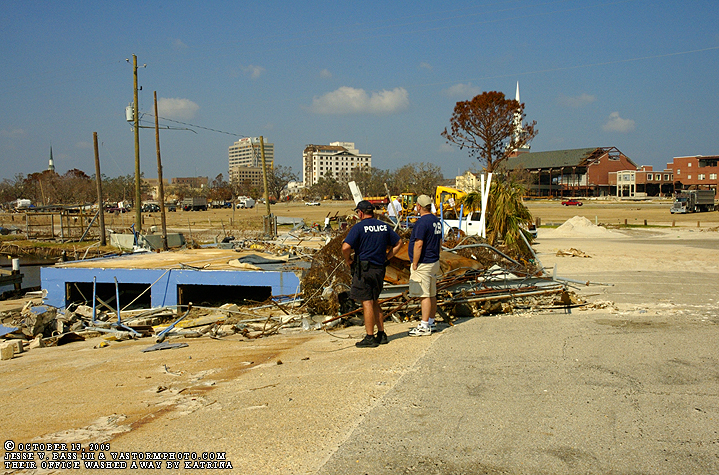 They discussed the Storm Cases as the officer remembered talking to them after Katrina. Their office is in the background- or what's left of it. The police office out on Eurie Pier. Mike Watkins chats with another officer about that morning. Along Hwy. 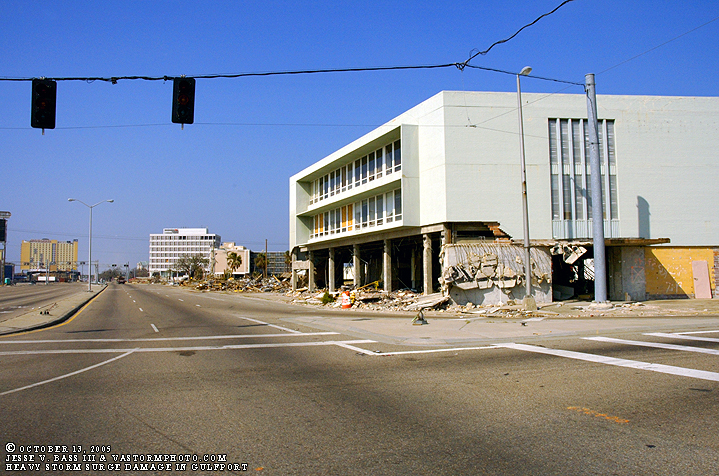 90 along the Gulf, there was a Holiday Inn that has become rather famous because of Katrina. 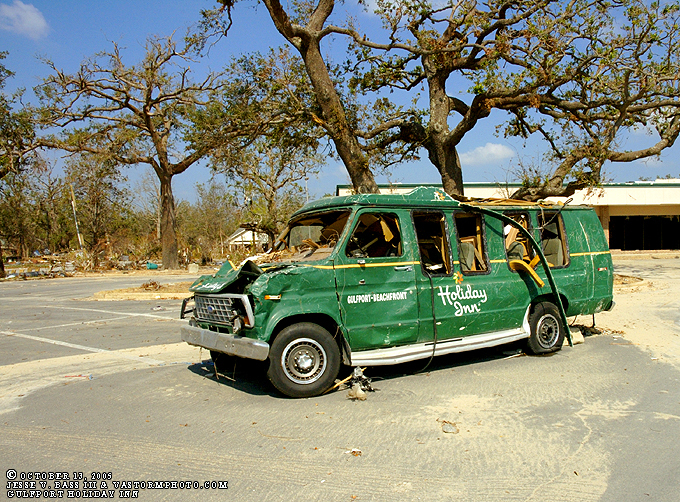 this is the hotel that fellow chasers Jim Reed and Mike Theiss stayed in and captured some incredible video and still images of the massive storm surge as it slammed into the hotel. 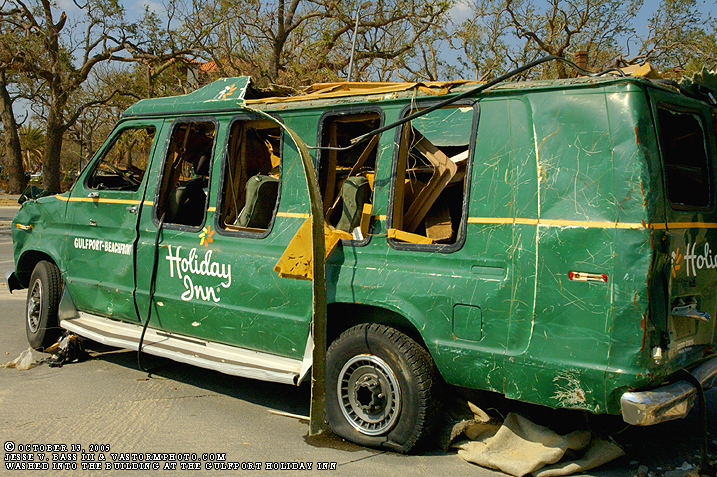 This van was one of several vehicles that was pushed into the lobby of the hotel. 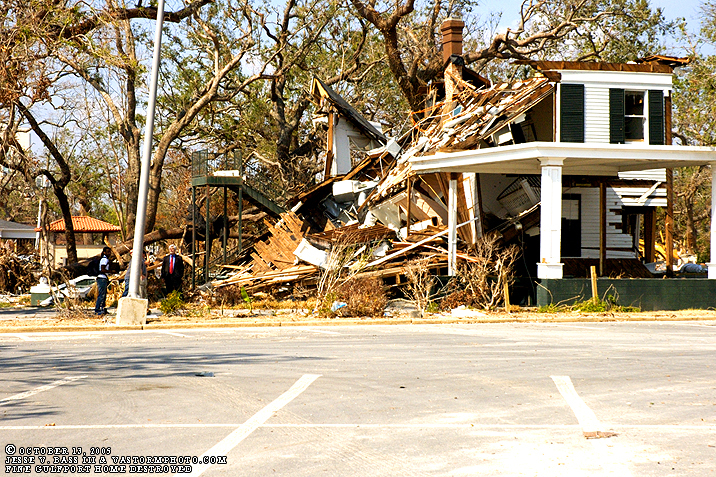 Next door to the Holiday Inn, this beautiful home sits in shambles-destroyed by the storm surge. It's easy to see by these two photos how high the water really was. 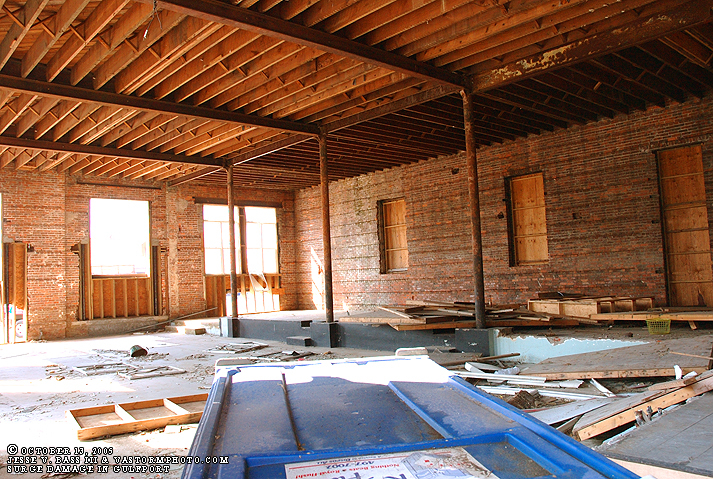 In both shots, the first floor was gutted by the massive surge, like many buildings in the city of Gulfport. This foundation was whipped clean. Only the stairs remained. Little did we know that this would be what a small town just a few miles west of Gulfport would look like. 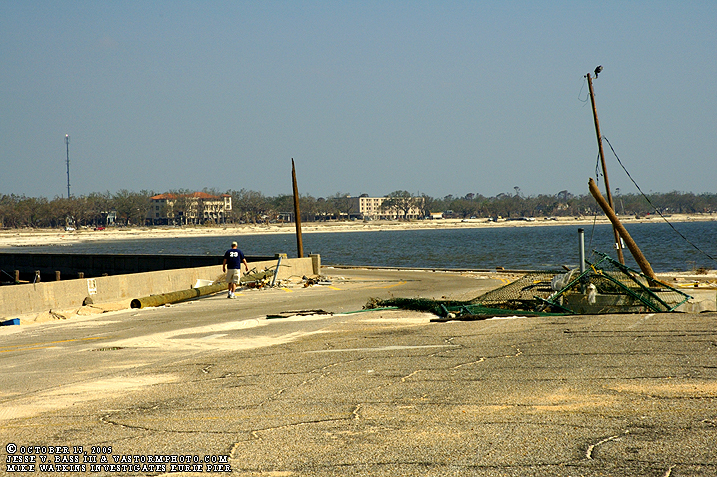 At least in Gulfport there were structures still standing along the waterfront. This would just not be the case in the town of Waveland. 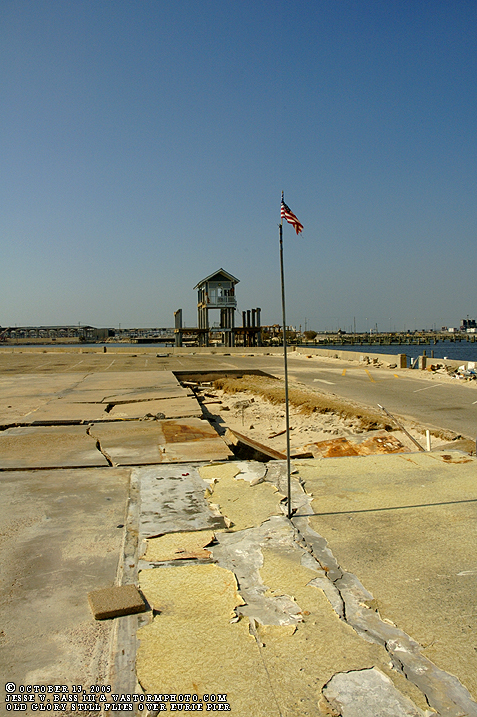 We had to drive back north to I-10 to get out of Gulfport and head west to Waveland as the Hwy 90 span of road and the bridge that leads to Waveland across the St. Louis Bay was completely washed away by Hurricane Katrina. As bad as it was in Gulfport, we were not ready for what we were about to see. total devastation and an entire town washed away.